The new SPR-315 solar panel is planned for commercial availability in the Spring of 2007. SunPower will begin delivering its SPR-315 solar panels to customers this summer. measured the actual power output of the SunPower 315 watt nameplate-rated solar panel at 321.65 watts, giving the panel an unprecedented [back-up] module efficiency of 19.7 percent. 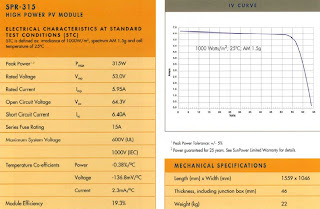 As an astute reader commented on my first SPR-315 post, the specifications below released at Solar Power 2006 state the module has a Peak Power Tolerance of plus or minus five percent (+/- 5%). This means SPR-315 modules are guaranteed to be in a range from 299.25Wp (Watt peak) to 330.75Wp over the module’s 25 year operating life. If you check the SunPower website, the specifications for the Gen 2 solar cells used in the SPR-315 and the SPR-315 solar module itself are not posted. Since I missed SunPower’s Annual Stockholders’ Meeting because of a last minute snafu, I listened to their presentations at recent investor conferences. On May 14, 2007, at the UBS 2007 Global Alternative Energy Conference, SunPower CEO Tom Werner mentioned M.SETEK Co.,Ltd. had made their first polysilicon 2 days ago but no ingots yet. Please see M.SETEK’s Polysilicon Plant Photo Preview and SunPower Extends and Expands M.Setek Silicon Supply Agreement for background detail. This is a complete scam by SunPower. We’re in December 30th, finishing 2007, and still no sign of this miracle panel anywhere. I’ve sent many emails to SunPower, I’ve even call them in the US and asked what is going on. They said they would return my call but another month has passed and nothing happens. This panel is pure vaporware! I’m going for Sanyo HIT 215Wp, I’m sick and tired of waiting for these guys.